If you are looking to get carpet installed in Armada, then we have some good news for you. Here at The Carpet Guys, you can get in contact with the best carpet installers in Armada. We strive to give customers the finest flooring service they can get, and with the services we provide, we achieve that goal. We also believe that it is important to have a healthy home environment, so we offer a free air duct cleaning to promote home health. When our installation crew arrives at your home, we can move the furniture in and out of the rooms upon your request. After the room has been cleared of the furniture, the old carpeting is removed. It gets bundled up and placed outside by the curb. Fresh carpet padding is rolled out, and they type of carpeting you selected is placed on top and installed. Once the installation is complete, the remnants are taken out of the room and the furniture can be placed back into the original layout. Do not spend any more of your time looking for professional carpet installers in Armada anymore. 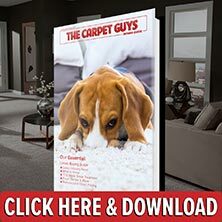 The Carpet Guys is the number one carpet dealer to work with, and we will prove that to you with the work we provide. Take a few moments to fill out a free in-home estimate via our website or by phone to get started. We are looking forward to servicing you.